Watch the complete action of the Audi Sport R8 LMS Cup round 10 race at Sepang International Circuit, Malaysia. 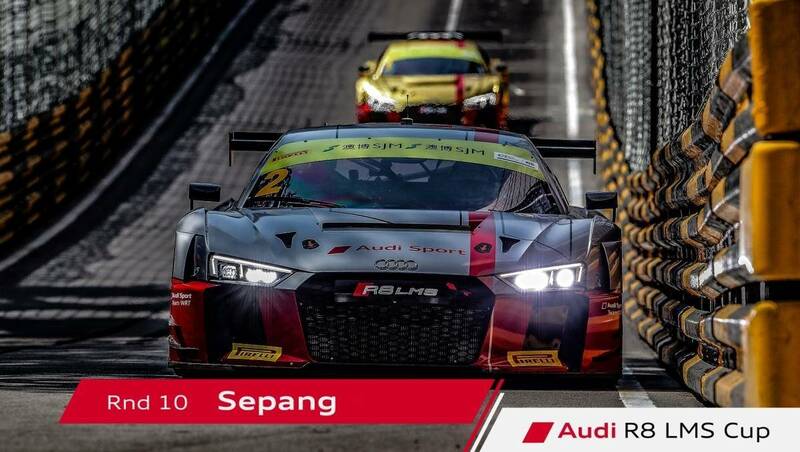 The penultimate race of the 2018 Audi Sport R8 LMS Cup under the floodlights of the Sepang International Circuit has set up a nail-biting season finale. ProMax Team’s Andrew Haryanto took his second victory of the year to close the gap to just two points from championship-leader Bhurit Bhirombhakdi of Singha Plan-B by Absolute Racing, who was third across the line. Despite carrying 20kg of success ballast, The Bend Motorsport Park’s Yasser Shahin thundered to second place on his night race and Sepang Circuit debut.